You cover your grill, should you cover your AC? If you live in the colder climates of the United States and Canada you probably take in your lawn furniture and cover your grill come late fall. Should you cover your Central AC unit? There are certain key times throughout the year during which maintenance on your heating and cooling needs to be done. As we’ve written about in previous posts, your air conditioner maintenance should take place in the spring and your heating unit should be worked on in the fall. Apart from that, people do wonder about whether they should cover their outside air conditioning units when the weather turns cold. There are very good reasons to cover your unit after summer and it’s not just for winter. Your unit is built to withstand the rain and snow, but it’s not built to keep out leaves, seeds, pollen and nuts. You really only need to cover your unit in the fall, when leaves and other debris can get into it. This debris can create places that trap moisture, which in turn causes corrosion. It can even block the unit’s built in moisture drainage. You can buy covers at a local hardware store or you can even make your own. If you do plan to make your own cover keep in mind that it should only come down about 6 inches on the sides. You don’t want to cover it completely. Covering the unit completely could trap moisture inside causing rust and corrosion. While items such as swimming pools, lawn furniture, grills and other outdoor items are covered to keep the elements away outside air conditioners do not require this type of protection. Keeping dirt out of the unit by covering it would seem like a reasonable assumption, but dirt is already sucked in when the unit is on. When the unit is off, no dirt or other debris will go inside. Outdoor cooling units are also built to withstand harsh winter conditions, which eliminates the need for cover. Additionally, one might think that a cover could keep small animals away. In fact, the opposite is true. Little critters who want to get away from the cold could easily consider a covered air conditioner as a nice winter home. Remember, your air conditioner is already built to withstand typical winter conditions. 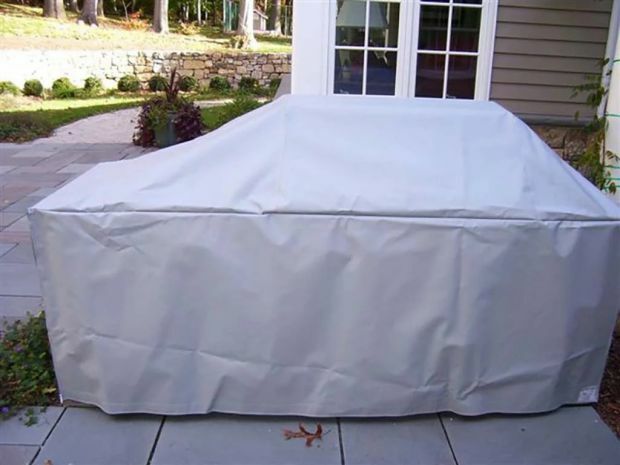 Therefore, while it might seem that covering it will protect it, you really only need to cover the unit in the fall. Please note: For those lucky enough to have mild winters, do not cover your outside unit. You might have an outside heat pump and covering it will cause the heat pump to cycle off due either a pressure switch or a compressor overload.